Two men have been sentenced today (14 March) in connection with a series of keyless car thefts which saw up to £250,000 worth of cars taken from driveways across Surrey and South West London. The charges relate to twelve offences where thirteen high-powered cars, including BMWs, Range Rovers, a Mini and a Jaguar were taken. One of the men was arrested following an early morning raid last June, carried out based on an intelligence led operation by Surrey Police. It saw officers piece together evidence using a number of different tactics to build up a case following a string of thefts of high-value vehicles. 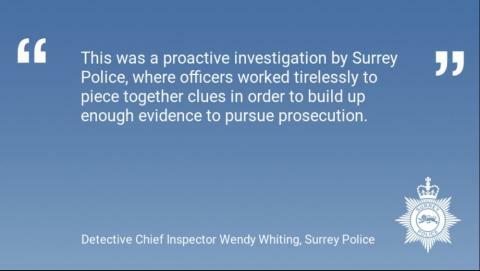 Detective Chief Inspector Wendy Whiting said: “This was a proactive investigation by Surrey Police, where officers worked tirelessly to piece together clues in order to build up enough evidence to pursue prosecution. Charlie Flint, 20, whose last known address was Halepitt Road, Great Bookham, pleaded guilty to one count of conspiracy to steal motor vehicles. He was charged with one count of conspiracy to steal motor vehicles, was sentenced to 30 months in custody and will also have to pay a £140 victim surcharge. Benjamin Shoebridge, 36, from Blair Avenue, Esher pleaded guilty to one charge of conspiracy to commit theft, relating to one offence where a black Land Rover Discovery was stolen from a driveway in Wimbledon overnight on the 27-28 August 2017 (Offence 3 listed below). He was charged with one count of conspiracy to steal motor vehicles and sentenced to 10 months in custody, suspended for 12 months. He will also have to attend an accredited program for 19 days, attend a rehabilitation program for 20 days and pay a £140 victim surcharge. The investigation started after a black Land Rover was reported stolen from a driveway in Walton-on-Thames. It was taken overnight between the 18th and the 19th of October 2017. Police in Kent performing a routine stop found the car just nine days later, loaded on the back of an HGV in a motorway service station, along with two other vehicles also stolen from Surrey. Over the following eight months, police investigating a number of keyless car thefts across Surrey and South West London built up enough evidence to link the thefts together. When keyless entry car fobs or cards are near the vehicle, they emit a signal that the car senses, unlocking the doors and allowing the engine to be started. If a car with keyless entry is parked in a driveway and the card or fob is inside the house, thieves can use relay devices to pick up the signal, amplify it and trick the car into unlocking the doors and allowing the engine to start. Make sure your car is properly locked and don’t keep your keys near doors or windows. Keeping your car keys in a metal tin may help, or you can also buy signal blocking pouches. Use physical barriers such as a steering lock, a driveway parking post or a wheel clamp to discourage thieves. Check your manual or speak to your dealer to find out whether you can switch your key’s signal off. Installing a car tracking device greatly increases the chance your vehicle will be recovered, if it is stolen. Offence 1: August 9/10 (overnight) – Theft of a blue Range Rover from Waterhouse Lane, Tadworth. The vehicle was recovered with false plates on September 10 in Woking. Offence 2: August 17/18 (overnight) – Theft of a white BMW from Molesey Park Road, West Moseley. This car is still outstanding. Offence 4: September 29/30 (overnight) – Theft of a white Range Rover from Cramner Close, Weybridge. The vehicle was recovered on 4 October from Ebbisham Road in Epsom with false plates, which were later found to be cloned from a vehicle registered to an address in Bookham where Flint was staying. Offence 5: October 7/8 (overnight) – Theft of a green Land Rover Discovery from Denbigh Gardens, Richmond. The vehicle was recovered together with the black Range Rover Evoque mentioned below, with its original plates. Offence 6: October 9/10 (overnight) – Theft of a black Range Rover Evoque from Camberley Avenue, Raynes Park. The vehicle was recovered from Crabtree Lane in Great Bookham on the 10 October along with the green Land Rover Discovery mentioned above, with its original plates. Offence 7: October 10/11 (overnight) – Theft of a white Range Rover from Esher Road, East Molesey. The vehicle was recovered with original plates from Tabor Court, Cheam, in Surrey, an area covered by the Metropolitan Police. Offence 8: October 18/19 (overnight) – Theft of a black Mini Cooper and a black Land Rover Discovery from Silverdale Avenue in Leatherhead. The Mini Cooper was recovered on the 20 October from an address in West Molesey. The Land Rover was recovered on the 19 October from the address Flint was residing in at the time. Offence 9: October 18/19 (overnight) - Theft of a black Land Rover Discovery from Queens Road in Walton-on-Thames. The vehicle was recovered on the back of a vehicle transporter on a lorry park in Ramsgate in Kent on 27 October with false plates, which upon forensic examination were shown to bear the fingerprints of Flint. Offence 10: October 23 (evening) – Theft of a blue Land Rover Discovery from Weybridge. The vehicle was recovered on the back of a vehicle transporter on a lorry park in Ramsgate in Kent on 27 October with false plates. The front numberplate bore a fingerprint matching Flint’s. Offence 11: October 23 (evening) – Theft of a black Jaguar XF from Imber Close, Esher. The vehicle was recovered on the back of a vehicle transporter on a lorry park in Ramsgate in Kent on 27 October with original plates. Offence 12: November 8/9 (overnight) – Theft of a black Range Rover from Toynbee Road, Wimbledon. The vehicle was recovered 9 November with false plates near an address in Carshalton. Flint was imprisoned by the time this offence occurred.